Both of my parents were raised by the Bible, one Catholic and the other Lutheran. But neither thought it appropriate to place their man made religion onto their children so my sister and I grew up studying many religions and choosing our own personal path. I hug trees and believe in Mermaids. I also know that a visit to the Ocean, a good dance class and time spent with my daughter is my “church”. 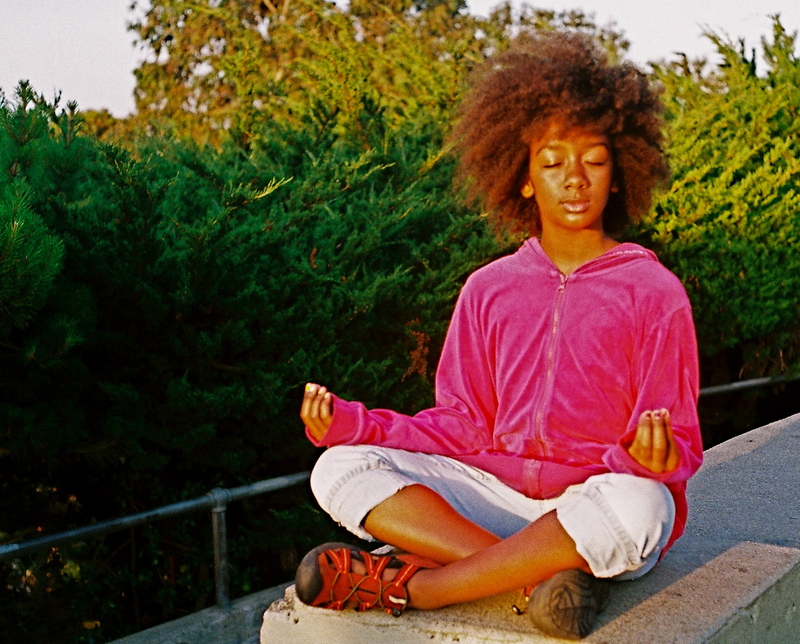 And now that my child is of an age to explore, I empower her to find her own spiritual path…. Beware of self-entitled Royalty claiming knowledge thru headwraps, quick to pass judgment, all the while color struck by their own rhetoric; Pay attention to those who actually walk regal with no adornment, collecting extensive libraries along the less glamorous path of historical Truths. Beware of the white liberal yearning to teach us how to create the art WE invented, hands digging deep into the pockets of post affirmative action; but Pay attention to those that push out creativity in the form of melodic melodies using paint from the collective consciousness. Beware of those lurking behind the safety of anonymous Internet, starting drama with quick strokes & a mean spirit, seemingly unaware that their bad karma is showing; do Pay attention to those who deal with confrontation directly, expressing by example what all healers instinctively know, that it’s better to expose the underbelly. Beware of the noncustodial parent who plays games as if they are the child still in need of suckling, time outs and a stern spanking; Pay attention to those who pitch in to help raise the Tribe, overstanding that it takes a Village as they confidently walk their talk. Beware of the vultures that love to consume POC identity by speaking pidgen, sporting bindis, matty locks and/or Frida beads, appropriating yet another culture; but Pay attention to those who never try to be anything they’re not because they understand that we are all Indigenous to our own personal ancestral land. Beware of those in power embracing our children too intimately and then pimping them out for profit while labeling them deviant, ambivalent, dangerous as excuses to kill them; do Pay attention to the urgency of our Youth, forever in need of soft handed guidance that gives wiggle room for mistakes as WE grown ups repeat to THEM ‘you’re so talented’ ‘good job’ ‘I love you’ and witness them circle in tighter to us. I didn’t choose to be a single parent but I also didn’t wallow in the perceived sorrow of it. I stood up to the challenge and though everyday is a mini struggle, my daughter and I are fine. She is a goddess in training and I am the guidance that lights her way daily. I became a mother at the end of a relationship. And I have never regretted this decision. Absent parent: A parent who does not live with their child but has financial responsibility for them. Also known as the non-custodial parent. I recently finished a 10-month ordeal within the walls of Family Court. Interestingly, I began these proceedings when my daughter was 2yrs old. I opened the case of joint custody and visitation rights at a time when rose-colored glasses were still in. I know, it sounds crazy. On the one hand, I actually went through the effort to do this and on the other hand, he ignored my effort and forgot about us for the next decade. Breath training is a basic tool with many uses, and children age four and up can learn and use breath effectively. Start by practicing these techniques through exercises yourself. When you’ve experienced the benefits and feel confident, it’s time to teach the children. Once the actual court proceedings started, deep inside I was hopeful that in his absence he actually grew up and wanted to be a part of her life. I was elated and surprisingly, relieved. I was running out of excuses for him as my child aged and her questions became harder to answer. Unfortunately, on the first day of court I realized that he had not grown and was in fact trying to teach me a lesson by dragging us through embarrassing legal motions that I could never directly answer because of how he set it up. Keeping children safe is a powerful primal urge. Our concern tinges every parting, just as our gratitude infuses every reunion. Fear’s presence is subtle but constant: the pause at their bedroom door to hear gentle breathing, the quick inventory of new friends’ homes for hazards. Over the last year, I’ve watched him get overnight visits and then lose these privileges. I’ve watched him argue custody, citing that I’ve been blocking and then him not able to define blocking since that implies being present in our lives. I’ve watched him show up in court wearing brown suits with different women on his arm and then follow this up by contesting child support payments wearing old sweats and a backpack. All the while, I’ve listened to him regurgitate the same story from our daughter’s toddler days, not acknowledging the blooming woman who stood before him. Take a walk after the rain and splash in puddles. Find a running gutter or tiny stream and float leaves or twigs out to sea. Water to clean and Water to feed. Our last day in court found me on the stand articulating truth that only a parent who has been present the entire time could. With no hate, no ulterior motive, only the health of my daughter foremost in my brain. And when judgment fell in my favor, it felt like an enormous weight lifted off my back. All these months of confusion, depression, increased blood pressure, evaporated. But even as I left, his shame couldn’t stop his hateful tongue to lash out at me. He shared no blessings to the one human that has poured unconditional love around his child. No apology. No head bowed. No thank you escaped from his lips. No ritual can do as much to teach children to love nature as a friendship with a real tree. Nature teaches a wonderful lesson about the mystery of life: that everything changes and everything stays the same. I share this to help in the healing process of many single parents. It is not acceptable to be Missing In Action. It is not okay to be a deadbeat. If your ‘adult’ decision is that you will not step up to the plate, then step off. It doesn’t make it easier on the tribe to have you reappear when you think you’re ready. That reasoning is not only selfish but a disservice to your child.